Did you know that our penny is going to have four new back designs rolling out this year? Yup, the new coins will be rolled out over a three month period throughout the year. This is the first change to the penny in fifty years. 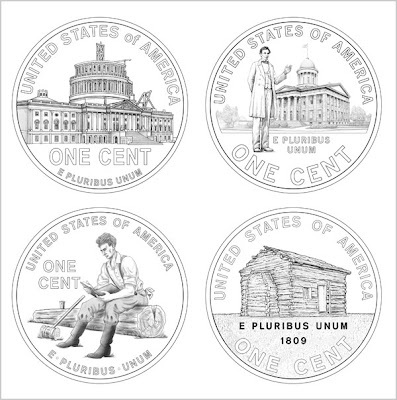 The coins are to celebrate Abraham Lincoln's birth and 100th anniversary of the penny. A few years ago there was talk of doing away with the penny because it costs more to make it than what it is worth. I love this cute little coin, quite happy that the decision was made to keep it and I'm looking forward to seeing the new penny.